Paws Pet Resort & Spa provides a high quality, safe and fun filled dog daycare for your pet when you don’t want to leave her/him home alone. Your best friend receives the optimum amount of play, exercise and rest each day and just the right amount of interaction with other dogs. Our staff provides a supervised and controlled environment that is just right. Our clean and modern facility is located in Cheshire, CT and convenient to all of New Haven county. 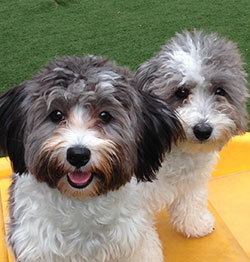 In our Dog Daycare program, dogs are separated into small groups based on age, size, activity level and temperament. Each session is approximately one and half hours long and includes open play time, obedience reinforcement, use of puppy playground equipment, outdoor play time, lots of positive reinforcement with hands on praise, and finally a nap in their own comfortable private room. When not in Daycare, your dog can relax in his/her own comfortable private two-room suite. Our suites have radiant heated floors, a resting bench and tempered glass doors. They will be provided with plenty of fresh water and can be served meals if you wish. Your dog will jump for joy in our indoor 3,000+ square foot canine gymnasium, or in one of the outdoor play yards during supervised playtime in groups or on an individual basis. Does your dog need a break from his larger brothers and sisters? Is your dog aging and can’t keep up with their younger, more agile playmates? If so, our individual daycare for your pets is a perfect solution. Here, they can relax in their own comfortable private two-room suite, with radiant heated floors, a resting bench, and tempered glass doors. 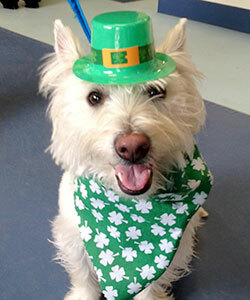 Our individual dog daycare guests have two walks included in their stay. You may wish to add on a Focused Play Session or additional walks. They will be provided with plenty of fresh water and can be served meals if you wish. Helps your dog develop a positive experience and confidence around other dogs and people. 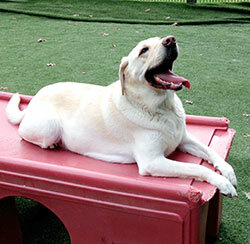 Encourages a more physically fit dog by providing just the right amount of activity and rest. Improves your dog’s health, happiness, and quality of life. Improves quality of life and extended life spans due to regular exercise. Reduces the risk of undesirable behavior at home such as digging, chewing, aggression and uncontrolled barking. Includes Evaluation. Reservations required and subject to availability. Can't be combined with other offers. Discount applies to first time customers only. Our dog, Kasey is staying at Paws. I want to take a moment to tell you how happy we are to have her there. We are so impressed with the cleanliness of Paws Resort and have out children bringing their dogs to you. I’m so grateful that you have designed Paws with everything we were looking for. We it not for my 5 grandchildren and their needs, I would love to work with such kind loving people who really know their stuff.